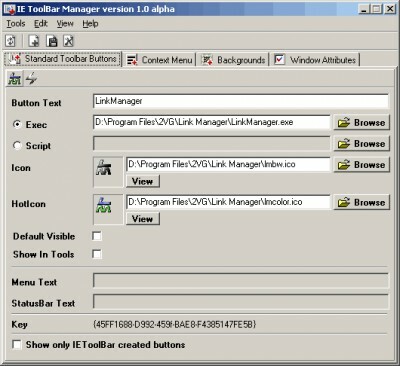 IE Toolbar Manager 1.1 is other software developed by 2VG Group. This program is intended to help you conveniently and effectively manage some aspects of Internet Explorer appearance and behavior. It has a simple user interface so it will not be difficult to master this program. With the help of IE ToolBar Manager you can easily add new buttons to the Internet Explorer toolbar as well as remove buttons from the toolbar. Also you can edit the context menu, change a background picture on the toolbar and other. This other software is shareware, which means you can download and use IE Toolbar Manager 1.1 for free during the trial period (usually for 30 days). At the expiration of the period you will have to buy the other product for $14.95. IE Toolbar Manager 1.1 is available at regnow and 2VG Group website. 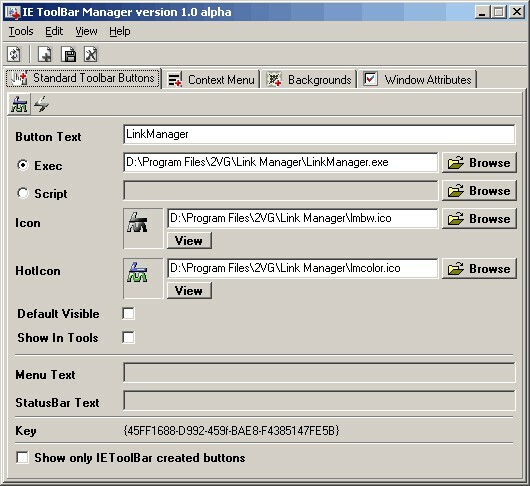 IE Toolbar Manager 1.1 supports English interface languages and works with Windows 98/XP/Vista. We have tested IE Toolbar Manager 1.1 for spyware and adware modules. The software is absolutely safe to install. We has completely tested other software IE Toolbar Manager 1.1 many times, written and published the interesting article and uploaded installation file (911K) to our fast server. Downloading IE Toolbar Manager 1.1 will take several seconds if you use fast ADSL connection. Add/delete toolbar buttons and menu items in Internet Explorer. Add Copy/Cut/Paste buttons to the Explorer toolbar of Windows 7. InstantBar allows to create toolbar, replace text with links in IE, show popup..
Softlookup Search Toolbar for Internet Explorer.